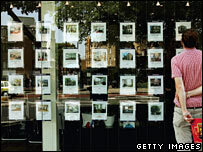 House prices fell for the third month in a row during January, according to the latest survey from the Nationwide. The annual rate of price growth dropped to 4.2%, which is the lowest rate since December 2005. Most housing surveys in recent months have suggested the market is slowing. Prices have been hit by higher interest rates and tighter lending criteria. Nationwide said the 3-month on 3-month rate of price growth - seen as a more reliable indicator of the health of the market - fell to -0.3%, down from 0.9% the previous month. The building society's data is the latest piece of evidence to confirm that the property market continues to weaken. Earlier this week the Bank of England said the number of mortgages approved for people buying a home in December fell to 73,000, its lowest level since July 1995. The latest figures from the Land Registry showed that house prices in England and Wales dropped by 0.4% last month the first fall recorded since August 2005. The Royal Institution of Chartered Surveyors (Rics) reported that the cost of getting on to the housing market has risen by about 350% from its most accessible point in 1996. The Financial Services Authority (FSA) also warned that a million homeowners could struggle to repay their home loans over the next 12 months. Hundreds of thousands of borrowers will see their mortgage payments rise sharply after their fixed rate deals come to an end. "The weakening trend in house prices during the last three months is consistent with the loosening in housing market conditions that has become increasingly evident in the data," said Nationwide senior economist Martin Gahbauer. "Key indicators such as mortgage approvals and the sales-to-stock ratio have now fallen close to or even below the troughs reached in late 2004, a period that was followed by a year of very subdued price growth. "This undoubtedly signals a continued cooling in annual house price inflation during the months ahead," he added. But Nationwide said it believed there were some "tentative signs" that the drop in demand could be "bottoming out", as potential buyers anticipated further interest rate cuts during 2008. After voting unanimously to cut interest rates from 5.75% to 5.5% in December, the Bank of England's Monetary Policy Committee (MPC) decided to hold rates in January. But many economists believe the MPC should cut rates at its next meeting in February. Howard Archer, chief UK economist, Global Insight, said it was clear the housing market had started 2008 as it ended 2007, under "substantial pressure". "This adds to the already intense pressure on the Bank of England to cut interest rates by at least a further 25 basis points to 5.25% next week, and to enact further reductions thereafter," he said. "However, inflationary concerns are likely to limit the pace of Bank of England interest rate cuts, so no more than a 25 basis point cut to 5.25% seems likely next Thursday," he added. Global Insight now expects house prices to fall by 5% in 2008, having previously predicted a 3% drop. It believes the market is likely to remain muted in 2009.